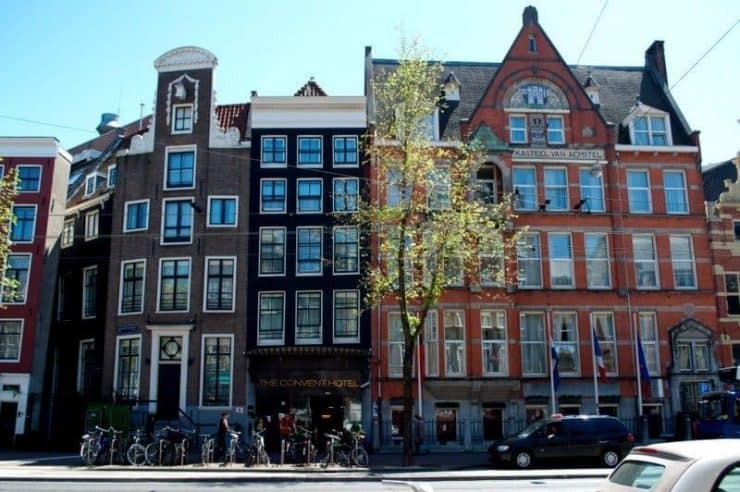 Amsterdam comes packed with museums, galleries and attractions but it all comes at a price. 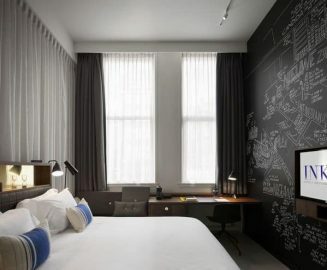 If you’re visiting Amsterdam on a budget by the time you’ve added travel to and around the city, accommodation and meals into your itinerary you’ll have made quite a dent in your wallet. 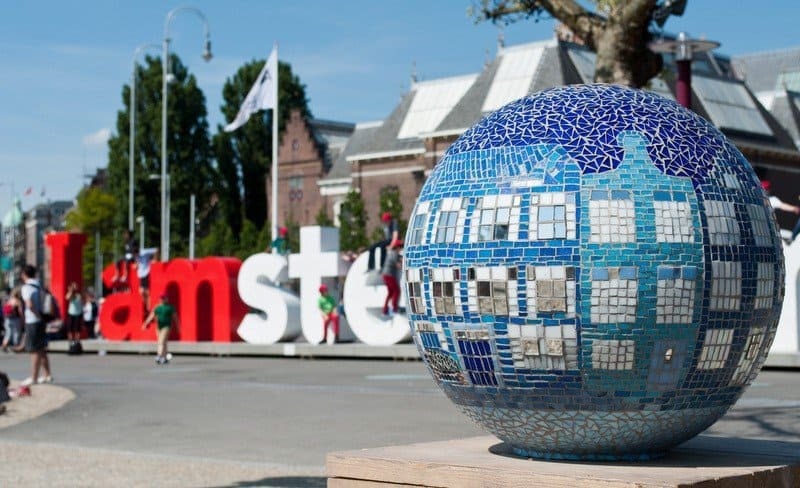 I’ve compiled a handy list of what to see for free in Amsterdam with a handy sightseeing map to help balance the bottom line of your Amsterdam budget and get just a little more bang for your buck. Sandeman’s New Amsterdam Walking Tours last around three hours and are one of the most economical and enjoyable ways to see Amsterdam’s top sights and at the same time get an orientation of the city. 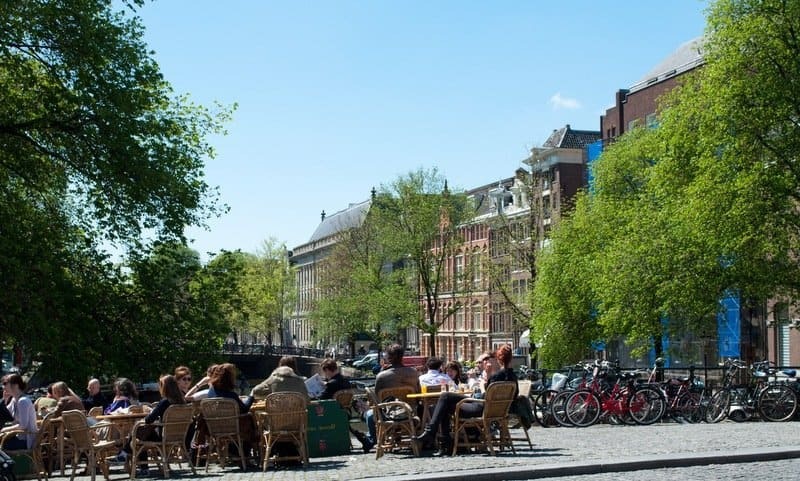 Young guides and students work show you attractions such as the Red Light District, the Royal Palace, Anne Frank House and Dam Square on a tip only basis or for a nominal charge. 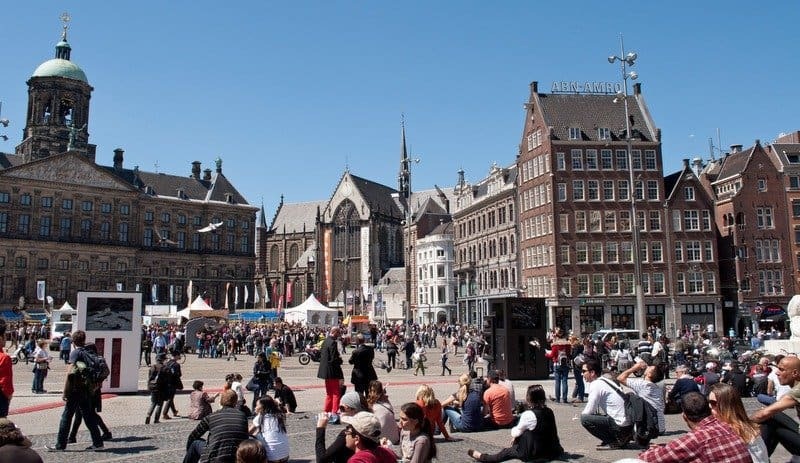 The historical centre of the city, Dam Square, bordered by the impressive architecture of the Royal Palace and Nieuwe Kerk (New Church), is where the buzz is going on. The National Monument stands across the road from the Royal Palace and you’ll find lots of busy shops, restaurants and bars around the Square. Spend time people-watching and catch a performance by the lively street entertainers and the not so lively ‘living statues’. Amsterdam’s most picturesque canals are in and around the Jordaan district where you can wander and admire the beautiful gabled buildings – some leaning every which way, their reflections rippling in the canal waters. Stop for a drink at the café by the Torensluis, the city’s oldest remaining bridge and watch the boats float by. Entrance to the Westerkerk (www.westerkerk.nl) – a huge Protestant church is free. Rembrandt is said to be buried somewhere inside although the exact location isn’t known. 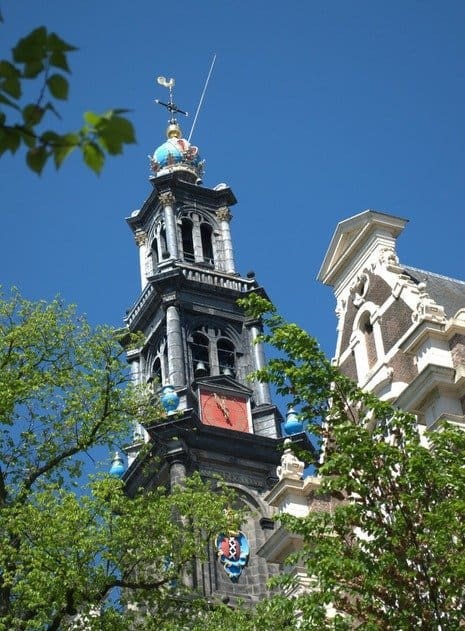 The church is often mentioned in Anne Frank’s diary as the chiming of its clock-tower could be heard from the Franks’ family hideaway (Anne Frank’s Huis) just a few doors away. 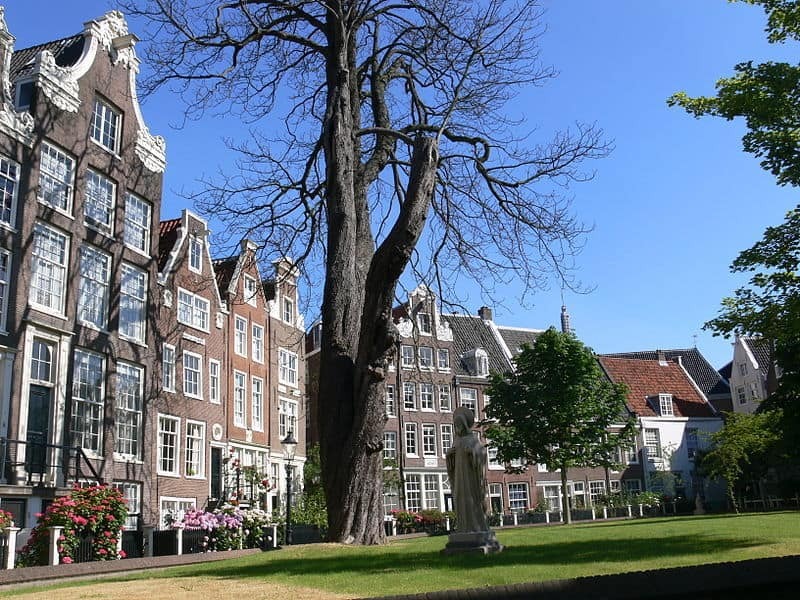 Next-door to the church at 263 Prinsengracht is the Sexton’s House and on the small square in front you’ll find a statue of Anne Frank. Towards the back of the church are the three triangles of the Homomonument. 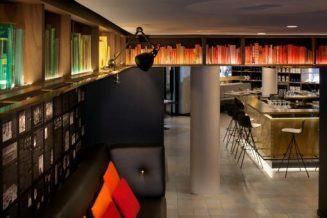 We stayed at Ink Hotel Amsterdam (although it was called The Convent Hotel when we were there) The newly renovated McGallery flagship boutique hotel. It’s located right in the heart of the city. 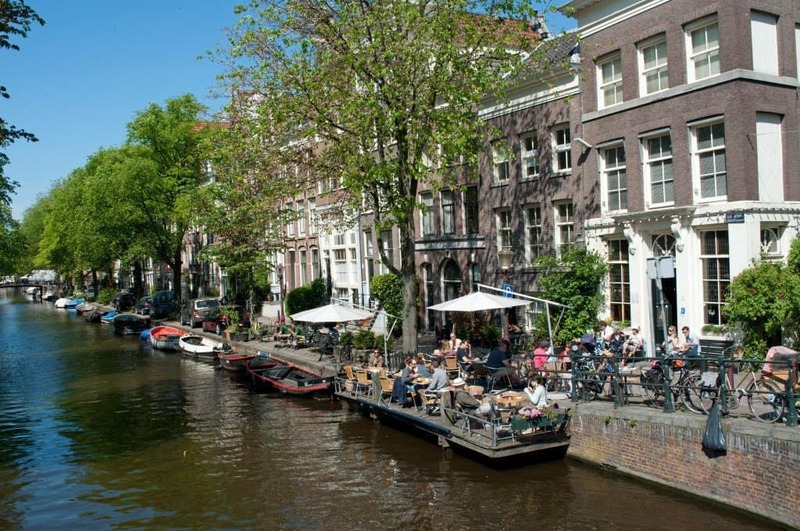 It’s just a 10-minute walk from Dam Square in one direction and Jordaan District and the canals in the other – perfect for visiting the main sights in the city centre and the quieter, pretty canal-side cafes, shops and restaurants of the Jordaan area. The main railway station is also just a ten-minute walk away with frequent trains to and from Schiphol Airport. One of Amsterdam’s most popular squares is the Museumplein, where you’ll find the Rijksmuseum and the iconic ‘I Amsterdam’ sign. 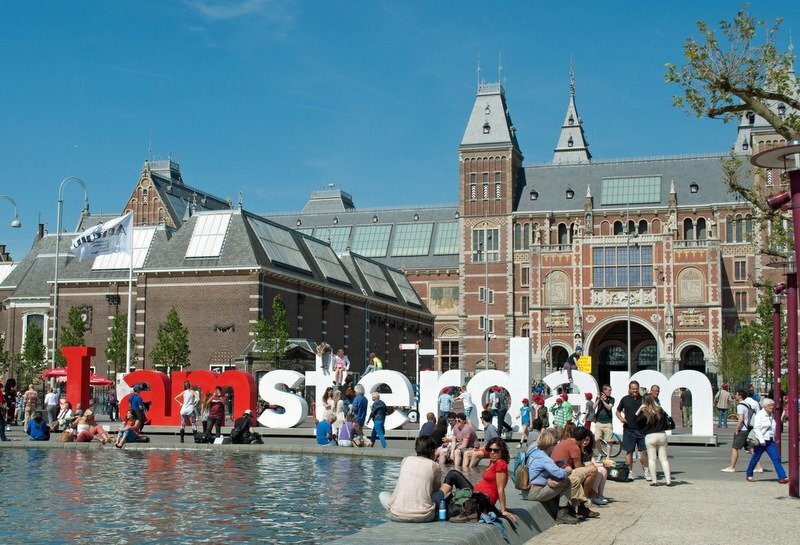 Pose, sit on or in front of the giant red and white letters for your very own ‘Me in Amsterdam shot’! Nearby is Vondelpark, one of Amsterdam’s biggest parks; take a picnic, relax in the sun and rest those walk-weary feet. 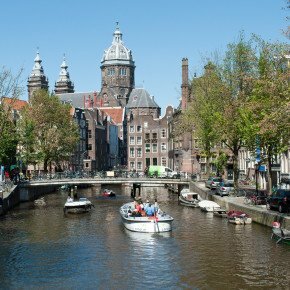 If you happen to find yourself in Amsterdam from September to June, also known as the cultural arts season look out for the free lunchtime concerts which take place on a Wednesday. Starting at 12.30pm, the Concertgebouw puts on 30 minute public performances as they rehearse for the evening performance. Arrive early if you’d like a seat. Just a few minutes walk from The Amsterdam Museum is the entrance to Begijnhof. This medieval courtyard is on Gedempte Begijnensloot www.begijnhofamsterdam.nl where you’ll enter an oasis of peace in the city; 14th-century houses and well-tended gardens along with a beautiful old church. Look for number 34, the oldest house in Amsterdam and one of only two remaining wooden houses in the city. Where: Find the Schuttersgalerij between the Kalverstraat and Begijnhof. Enter at Kalverstraat 92. Before you hop on your plane back home you can get your final free culture fix at Schiphol Airport. The Rijksmuseum puts on free mini taster exhibitions on Holland Boulevard, in the area behind passport control between the E and F Pier, it houses a permanent exhibition of ten works by Dutch masters of the Golden Age from the Rijksmuseum collection. If you’d like to plot your route through Amsterdam’s ‘free to see’ sights and attractions I’ve put together a little map so you can see exactly where to find all these little gems. Most payable museums and galleries are around €10-€15 for admission. Book in advance on-line to avoid precious hours spent queuing. Obsessed with this blog. Just a wonderful list my friend! Thank you so much – you’ve just made my day! Yes,lets hope so.Im off to Athens soon for the first time.It looks great.Any tips? Im afraid to say suzanne,that was the tourist areas.Ok.There were a few places to retreat to a civilized type of holiday,but compared to Paris,Tokyo,Rome,Berlin,Moscow,its really bad.Most tourists pretend not to see it. I expect it in Rio or Mexico city,even new york.Amsterdam?For me,never again. We actually didn’t see it Rich and we’re not the sort to be blinkered to it either. I know there’s a lot of organised crime in the city with the coffee shops and legalised prositition a cover for it. help alleviate the problem a little. Let’s hope so. I went to Amsterdam for a holiday and the only thing I found free was to watch the junkies sleeping in the street. Sorry to burst your bubble but I found the place sinister.Expensive everything,beer glasses that they fill with froth,constantly hassled by drug dealers,prostitutes and Romanian gypsies,rubbish euro music,inflated food prices,nearly run over by trans all the time,out of control stag and hen parties,countless serious assaults,smack heads in the gutter with needles stuck in their arms.Need I go on? Despite this its still uber cool for people to embellish their facebook by saying they have had an “amazing”time.Its just not the done thing to mention the huge sir in Amsterdams social fabric,is it? I guess you’d find all or most of the above in areas of all capital/major cities. We stuck to the main tourist areas and Saw very little of what you experienced. We got stung a couple of times with drinks but found some good food at good prices. Sorry to hear you had such an unpleasant time in Amsterdam. 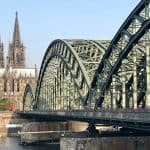 Great tips, will bookmark for my next Amsterdam trip, hopefully soon. The next trip can never come quickly enough! Wonderful, Suze! 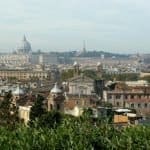 The free walking tours seem to be happening in lots of places now, and I’m all for them. Some great ideas here. It’s taken me this long to get there for the first time – will definitely be going back again, lovely city. I always like to know about the freebies! This is very helpful. I find Amsterdam too expensive to visit after a couple days. A much needed post, cheers. I couldn’t believe how much cash I went through in my one day in the Dam last year, and I didn’t spend a penny on accommodation. Walking around the canals would be my number one! It is good to know there are so many things to do that are free – the lunchtime concert sounds great! A superb, well writted guide Suzanne. Thanks for posting it and maybe we can make use of it at some future time.